Home » Mobile App Development » Do you have an idea on how much developing a mobile app will cost? 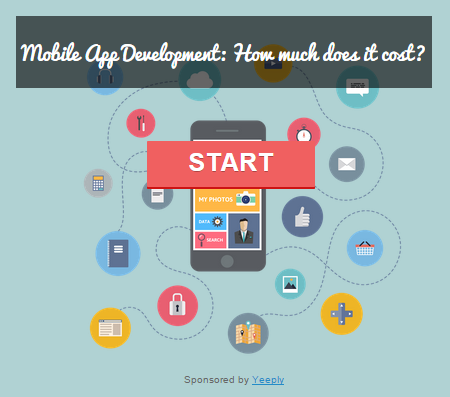 Is an online tool to calculate the average cost of developing a mobile app. Do you have a mobile app idea? Do you own a company or a website and would like to go mobile by creating a mobile app? Certainly lots of you have already though about this question: how much will it cost to create my mobile app? At Yeeply we’ve launched a tool online so you can get an approximate cost for your mobile app depending on the features you want on your mobile app. At Yeeply we often notice that one of the things that our customers aren’t aware of is the cost of their mobile app. That’s why we decided to launch the online tool www.howmuchcostanapp.com so that you can see how much it will cost you and then publish your project app in our online platform. To get your approximate cost for your mobile app you will need to answer a series of questions about things like interface, features etc… The online tool is very easy to use and you will only need a few clicks before you can know your approximate cost. The questions will be about key aspects of your mobile app like, what quality of design do you require? How would you like to monetize your app? How do you want users to log in? In how many languages do you want your app? You will only need a click to answer all these questions and would be able to see how the cost increase by adding features in the lower bar placed on the tool. It’s that easy to get an approximate cost for your mobile app and once done you can even share it on Facebook without unveiling your idea. So, what are you waiting for? The online tool you have been waiting for is now a click away. Visit the web www.howmuchcostanapp.com and find out the possible cost. How to make an app? With this roadmap!